MedFit TV (medfittv.org) is a collection of educational videos, webinars, and interviews with leading experts in their related fields and inspirational people who’ve improved their quality of life through exercise, nutrition and/or allied health services. 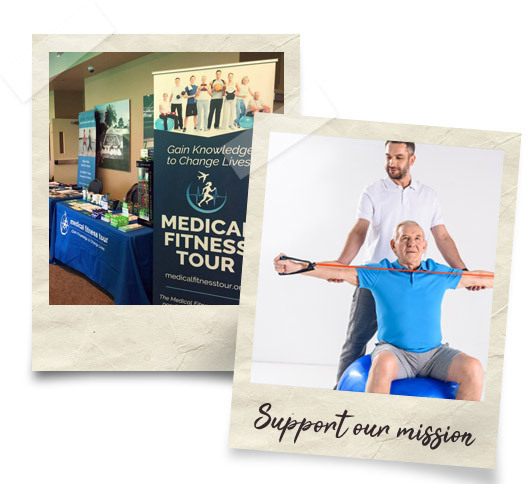 “We are excited to offer free community channels to the public, and free access to premium professional content for MedFit Network members,” said MedFit Education Foundation founder, Lisa Dougherty. Fitness and allied healthcare professionals can subscribe monthly or annually to gain access to premium content, including professional educational webinars that offer continuing education, taped Medical Fitness Tour conferences, and to stay current with the latest information on prevention, rehabilitation and preserving the quality of life for those with chronic diseases or medical conditions. You will find “channels” on a range of topics, including but not limited to: Active Aging, Alzheimer’s, Arthritis, Aquatic Rehabilitation, Autism, Cancer, Diabetes, Disabilities, Fall Prevention, Fibromyalgia, Genomics, Heart Disease, Joint Replacement, Medical Fitness Opportunities, Mental Health Challenges, Multiple Sclerosis, Nutrition, Obesity, Osteoporosis, Parkinson’s, Prevention of Chronic Disease, Post Surgical Rehabilitation, Respiratory Disease, Sleep, Stress Management, Stroke and women’s health issues including pre & postpartum care. MedFit TV is accepting video submissions for both community channels and premium content for fitness and allied healthcare professionals; those looking to submit existing videos, or produce original content for MedFit TV, should email contactmftv@gmail.com.